With three innovative patents, Optimum Tracker is giving the solar power industry a boost by creating a new-generation tracker that further improves the efficiency of photovoltaic farms in cloudy weather. 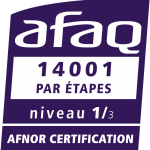 March 11, 2016, Meyreuil, France – Optimum Tracker, a company specializing in the design, production and installation of solar trackers at large photovoltaic power plants, has just filed three patents on its innovative application Opti-SkyControl. The system analyzes cloud cover in real time and adjusts tracker angles to maximize output when sunlight is diffuse. “We wanted to harness hardware and software innovation to add a ‘smart’ dimension to products that until now featured only mechanical innovations. The system is a revolution in the tracker world, opening the door to products in step with our times, delivering increasing performance, and in the service of the energy revolution,” says Madyan De Welle, co-founder and Innovation Director of Optimum Tracker. 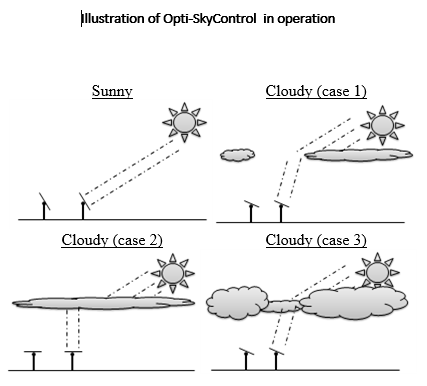 Opti-SkyControl: up to 2% output gain some month. Using a predictive algorithm, a hemispheric camera and photosensors that measure luminosity, the system is capable of making short-term predictions of changes in cloud cover. It uses these to calculate the tracker’s optimal angle of inclination to obtain the highest solar luminosity in the prevailing diffuse conditions. For even greater precision, Opti-SkiControl takes into account the types of wavelengths that are the most productive for the solar panels installed at the site, and swivels the array to face the most effective luminous point of the sky for those panels. “We have integrated artificial intelligence into the tracker: our algorithm analyzes its previous predictions to improve its future predictions. It can also recognize cloud types by calling on a previously learned database of cloud models and enhancing it with real-time onsite analyses. This permits longer-term and more accurate predictions based on local cloud behaviour,” explains Madyan De Welle. And better long-term predictive sky mapping means higher yield. Opti-SkyControl tells the tracker to switch to “diffuse light mode” only when the algorithm predicts a minimum dwell – a steady optimal capture angle – for real output gain. Studies by the ARMINE laboratory at Paris Mines Engineering School, which specializes in calculating the output of photovoltaic systems, quantifies the production gains as 0.4% to 2% a month depending on the period at different points of the globe. The General Manager Middle East Africa, Thierry Bodiot, will present Opti-SkyControl during the Power & Energy World Africa (PEWA) Conference, in Johannesburg on March 15 at 11:30 a.m.
Come and rediscover our innovations and some of our projects on Youtube ! 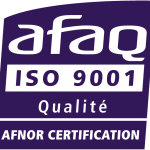 Optimum Tracker is certified ISO 9001 & ISO 14001 par étapes (1/3) in all its activities.